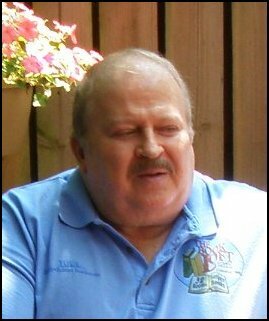 Roger Dee Tompkins, age 68, of Reynoldsburg, OH, passed away at 3:36 p.m. Thursday, Sept. 20, 2012 at the OSU James Cancer Center in Columbus. He was born December 16, 1943 in Zanesville, OH, a son of the late Robert W. and Margaret Barkhurst Tompkins. A Protestant by faith, he was a former Junior High School teacher at Pennsville Elementary, and owner-operator of the Book Loft of German Village in Columbus for 35 years. He is survived by two brothers, Bill Tompkins and wife, Linda of McConnelsvill, and Jim Tompkins and wife, Janice of Glouster; a sister-in-law, Michelle Tompkins of McConnelsville; several nieces, nephews, and cousins; special friend, John Feminella of Reynoldsburg; Book Loft co-owners: Karl Jacobsma and Russell Iler, both of Columbus and employees of the business. In addition to his parents, he was preceded in death by one brother Terry Tompkins. Services were held at 11 a.m. on Monday, September 24, at the MATHENEY FUNERAL HOME in McConnelsville wit Pastor Galen Finley officiating. Burial was in the Mcconnelsville Cemetery.